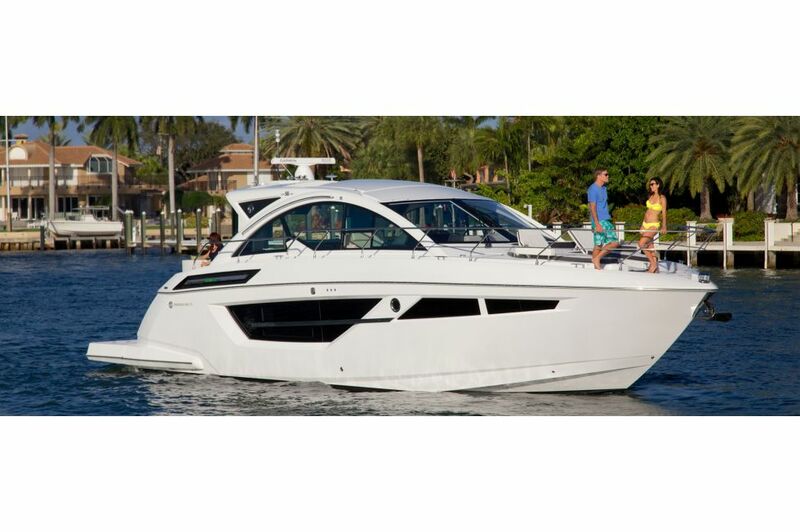 The expansive Cockpit of the 50 Cantius offers an array of premium accommodations, making it difficult to find your favorite feature. The plush wrap-around seating is one of the biggest stars in the space - easily accommodating upwards of 10 guests at a time. Going one step further, the hi/lo table can be converted to a sun lounge or raised for cocktails. 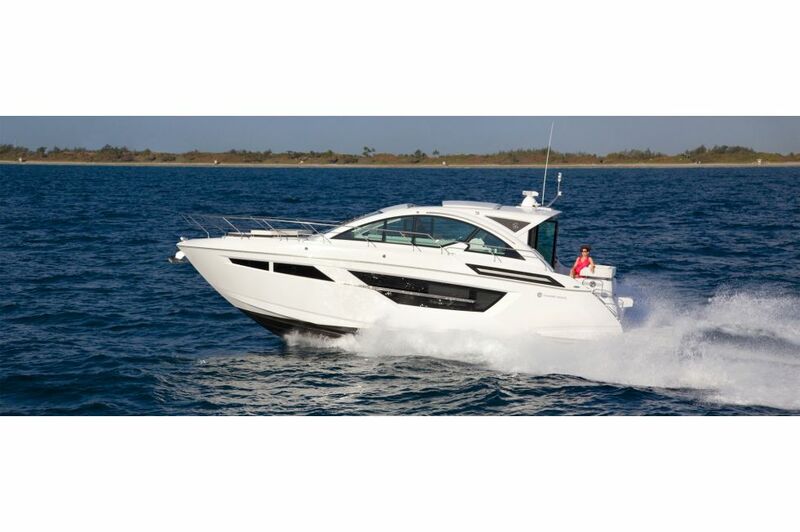 When you sit down to the helm of the Cruisers 50 Cantius it'll feel like you've finally arrived. The first-class design includes double seats and come equipped with flip-up bolsters and arm rests. 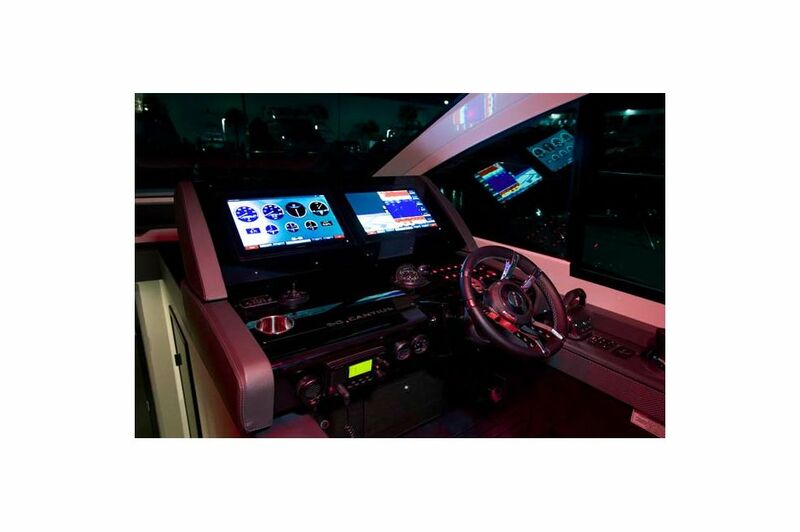 Digital throttles, joystick controlling and a panel with plenty of space for your choice in devices will have you feeling completely in control of this beautiful new yacht. Some say "you can't take it with you", but on the 50 Cantius you can. 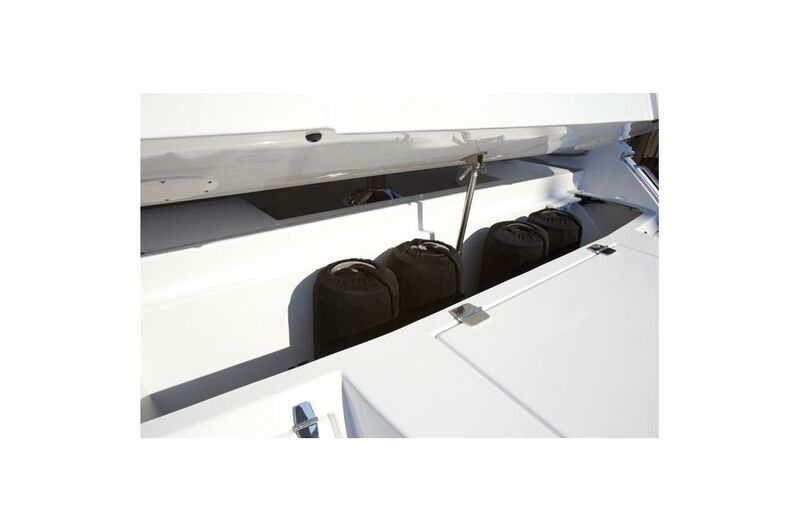 With spacious and efficient Transom Storage, never leave anything behind due to lack of room on the boat. 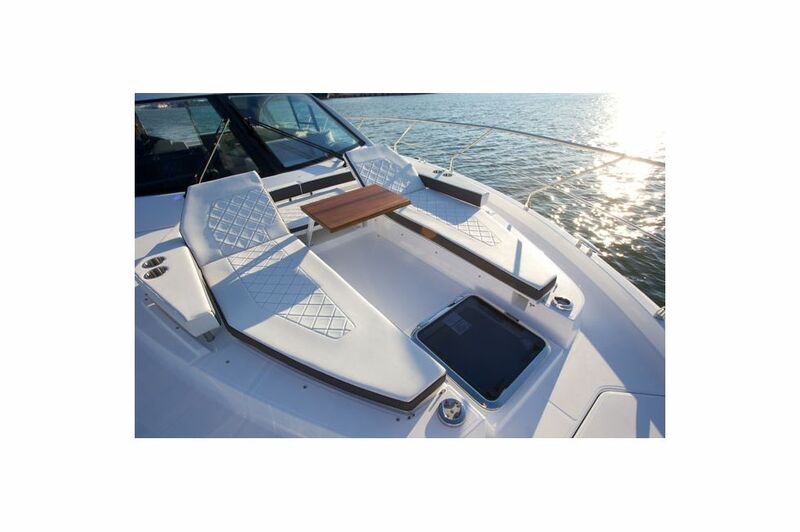 From watersports equipment to relaxation must-haves, bring aboard everything you need for an incredible weekend on the water. 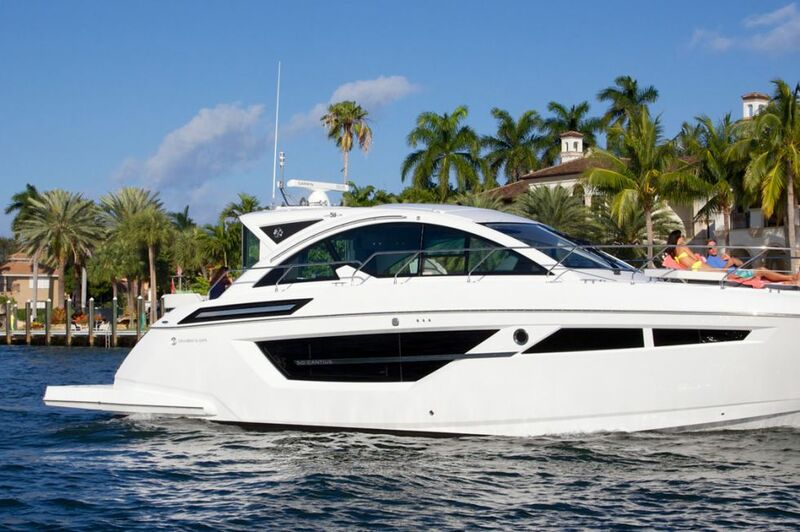 The Upper Salon of the 50 Cantius must be experienced to fully grasp the way it seamlessly connects the outside world with the refined luxury found onboard. 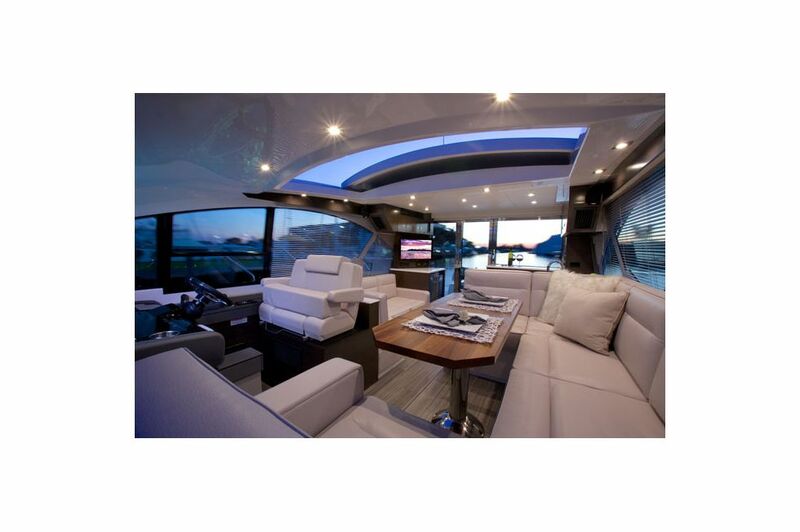 Panorama windows provide 360° views from the open-concept galley, dinette and helm. Retractable windows in the galley open aft to merge interior and exterior spaces, creating endless possibilities for unparalleled entertaining. Rest assured, your guests' time aboard will not soon be forgotten. 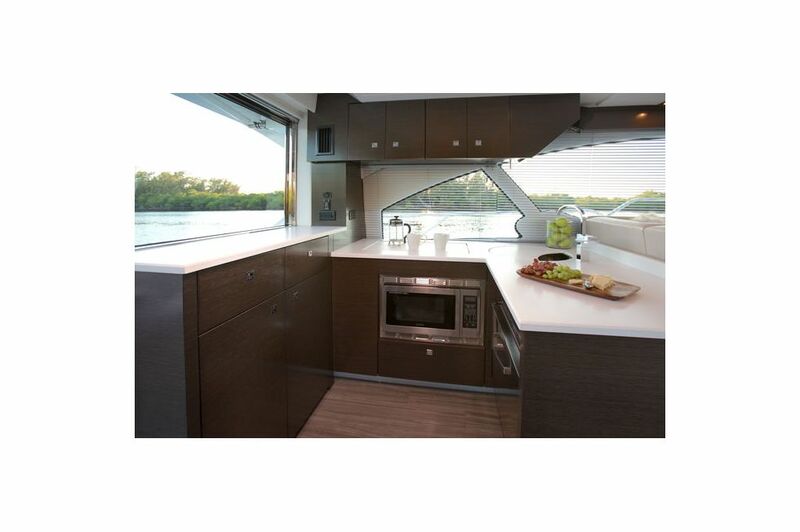 Everyone's favorite feature of the Galley is sure to be the retractable window that opens the space to the rear deck for passing refreshments and sharing conversation. 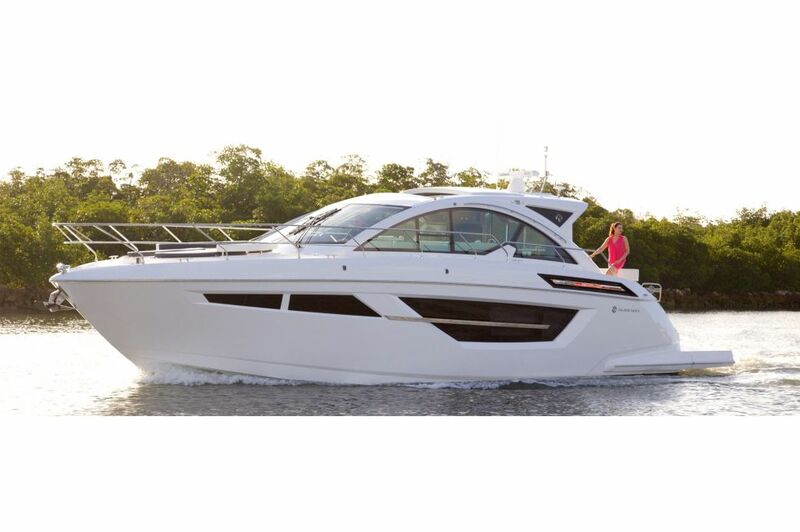 Ingeniously positioned aft to provide optimum entertaining functionality, the Galley aboard the new 50 Cantius allows host and guests alike to be at the center of attention. Clean lines and an intuitive layout give effortless access to the microwave, dishwasher, icemaker and cooktop. An oasis within an oasis. Spectacular side views through expansive windows. 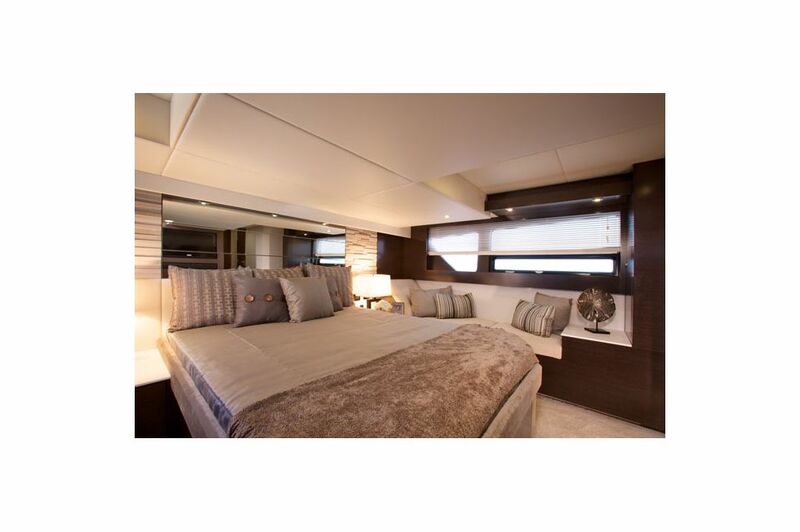 The Master Stateroom aboard the 50 Cantius is a stylishly serene and unusually spacious full-beam retreat. Surrounding the walk-around island berth you will find a café table tucked between two built-in seats, plus built-in nightstands and vanity. Additional hidden storage gives you all the room you need for life's necessities... and luxuries too. 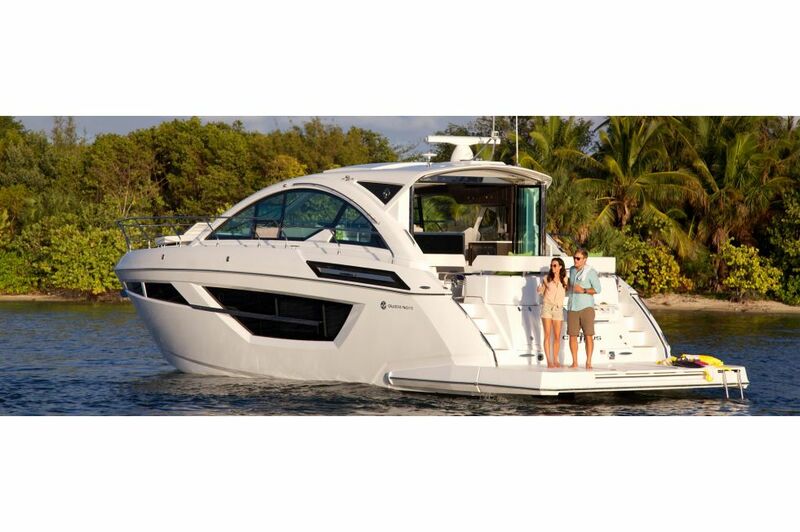 Give your guests the ability to relax in peace and unsurpassed comfort aboard the 50 Cantius. 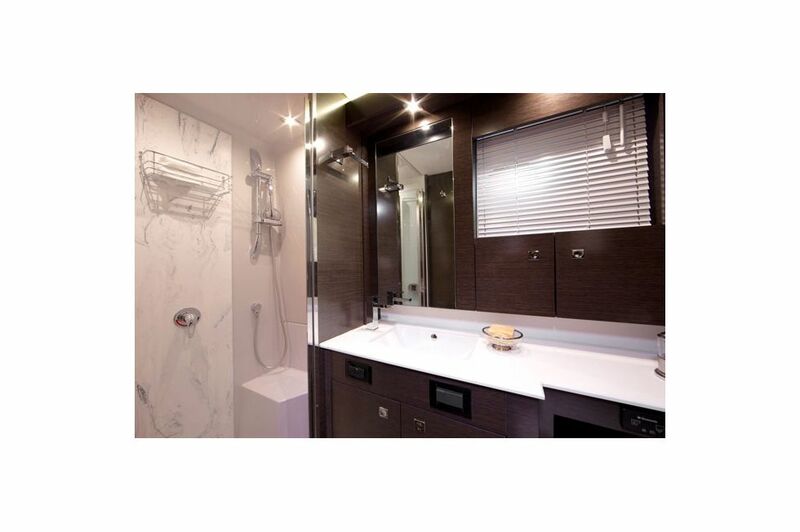 The Forward Stateroom found in the 50 Cantius ensures blissful days and tranquil nights for all, with a walk-around queen berth, generous storage and panoramic windows that provide the kind of waterfront views most can only dream about. The accompanying head is thoughtfully split with separate head and shower starboard and port. 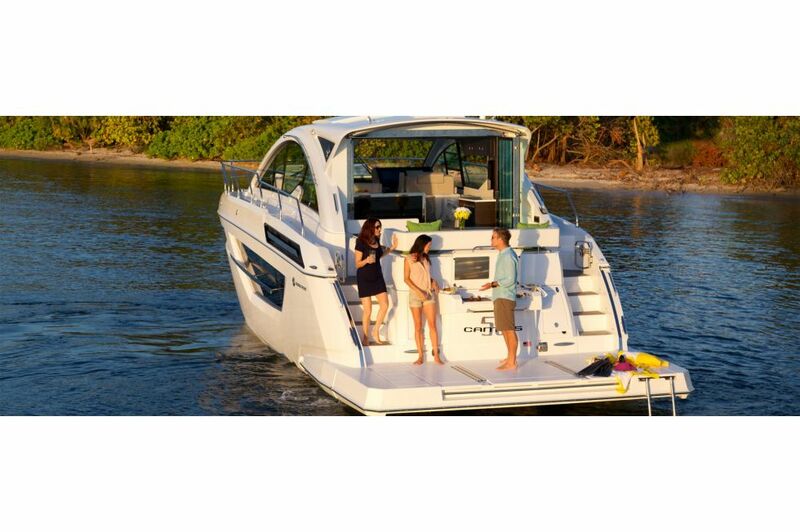 The 50 Cantius was designed for not only getting away from it all, but also bringing everyone together. With a Third Stateroom, it gives you the ability to do just that. 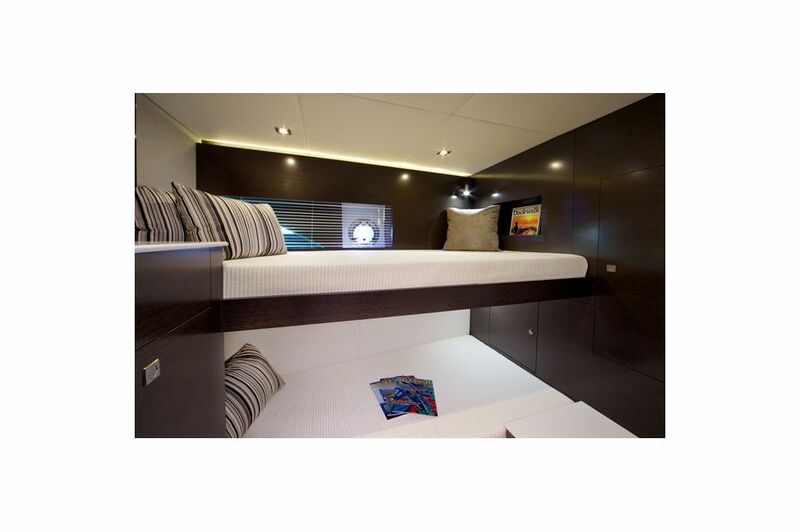 The wide hull window provides plenty of natural light and the spacious dual bunk beds provide plenty of space for overnight guests. A large TV, and additional storage make this space a welcome addition. 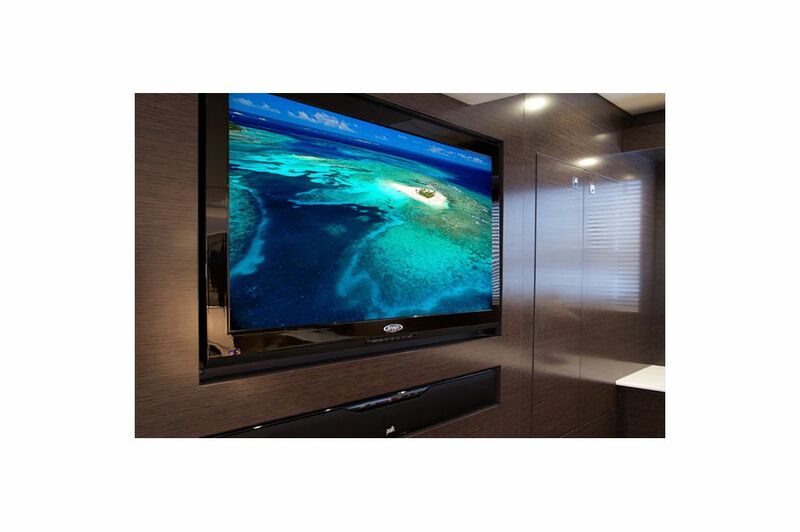 Transform the 50 Cantius's Master Stateroom into a Master Media Room with the press of a button, drawing the blinds on the hull windows. The built-in TV and audio system immerse you in state-of-the-art digital refinement that lets you properly enjoy your music and movie collections no matter where your adventures take you. 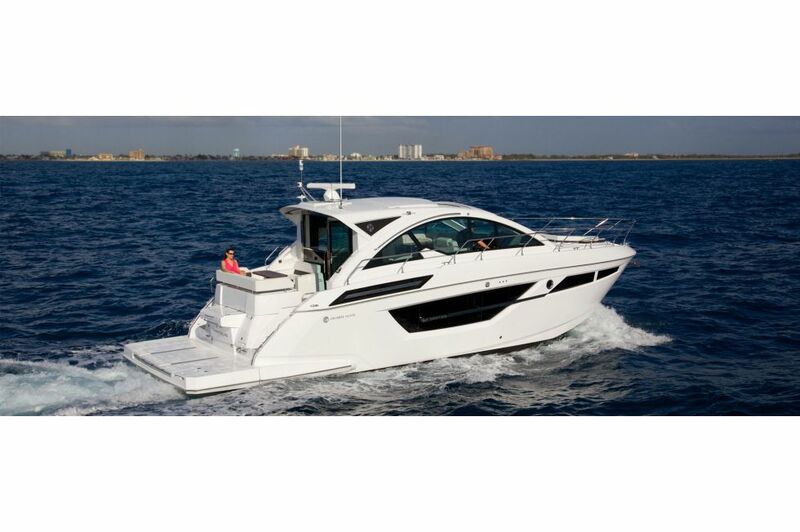 The Head aboard the 50 Cantius features the necessities you require on the water, including a fully-equipped sink, toilet, and storage, in a classic, convenient design. 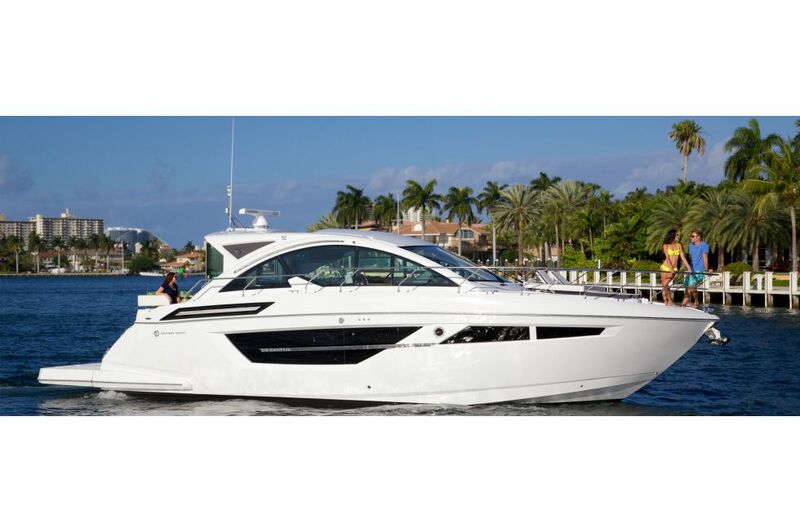 The perfect complement to the Master Stateroom, the Master Head aboard the 50 Cantius is a stunning marriage of style and function. Artful lighting and expansive mirrors turn this wood-detailed space into one that feels bright and spacious. 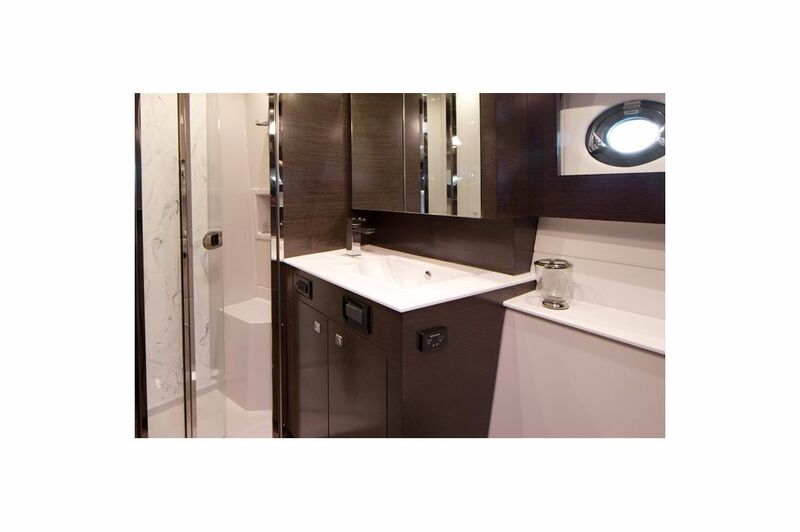 It features a separate full-standing shower adorned with a contemporary vanity with designer fixtures. 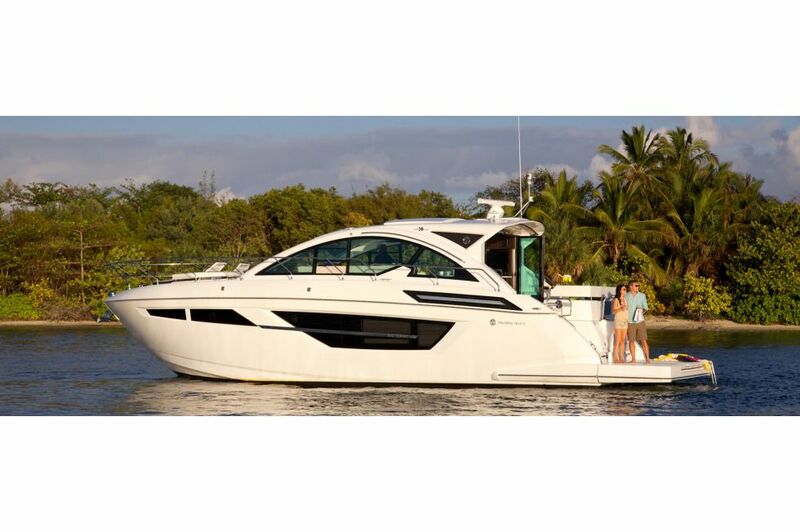 The 50 Cantius seems to have endless space. 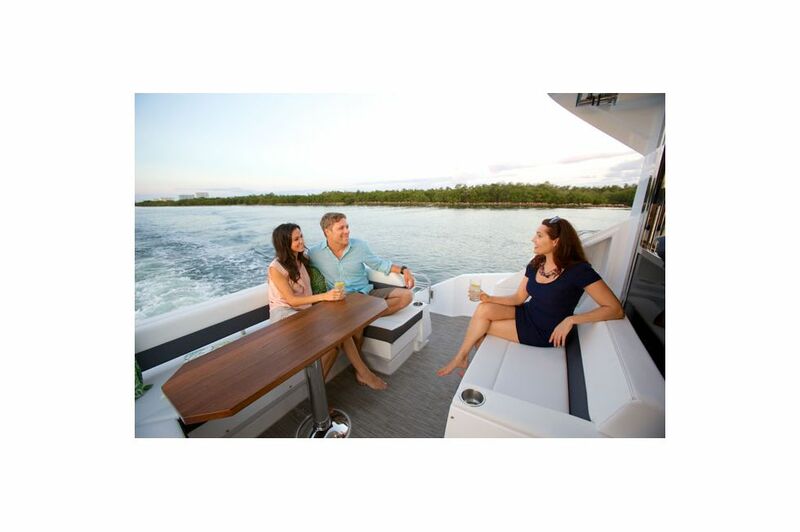 Take full advantage of all this yacht has to offer from bow to stern, including the comfortable bow lounge. Catch up on much needed conversations or escape the day-to-day with sunshine and beautiful views from the bow of this striking yacht. 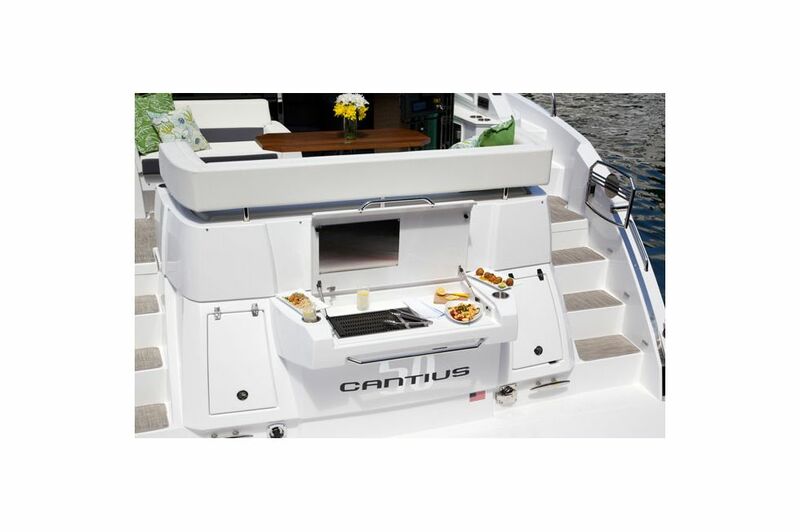 Steak, chicken, seafood, vegetables – meal preparation has never been easier aboard the 50 Cantius. Its Grill is compact to save valuable space, yet large enough to grill up any dish your taste buds demand for the entire party.